A digital clock will not be installed if your vehicle comes equipped with an audio system. Vehicles equipped with an audio system already have the clock installed on the system. Pressing the “H’’ button with your finger, a pencil or similar object will advance the time displayed by one hour. Pressing the “M’’ button with your finger, a pencil or similar object will advance the time displayed by one minute. To clear away minutes, press the “R’’ button with your finger, a pencil or similar object. When you release the button, the clock will be set precisely on the hour. 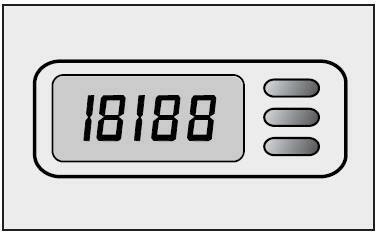 For example, if the “R’’ button is pressed while the time is between 9:01 and 9:29, the display will be reset to 9:00. If pressed while it is between 9:30 and 9:59, the display will be reset to 10:00.